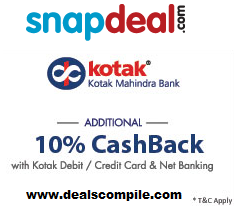 Another Diwali Bumper Sale of Snapdeal comes up , in which they are giving Additional 10% Cashback on online Orders using Kotak Mahindra Credit / Debit Card and Net Banking. **Minimum Transaction amount to get the 10% Cashback offer is Rs. 4000 and the Maximum Cashback amount which you can get is Rs. 3000. 6.Cashback will be credited back to the Card account by 31st December 2014. 7.Enjoy your product and cashback to buy more things ! !